The story behind this video? It’s an outtake from Monty Peeps and the Holy Grail. 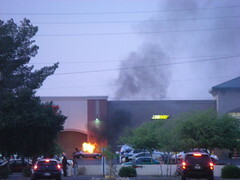 I started working on it over my “spring break” in the PHX but didn’t do much with it. I filmed the parts up to approaching the cute bunny, but I haven’t finished filming the elements featuring the bloody battle. 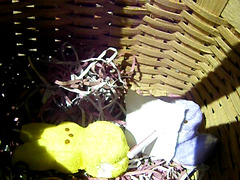 The yellow Peep chick is the bunny, and the purple thing is actually a lavender-colored peep. I stuck a straw in its side to serve as a sword, and the paper stuck through the straw is a “shield.” It’s kind of a hack job, but I thought it was kind of amusing.